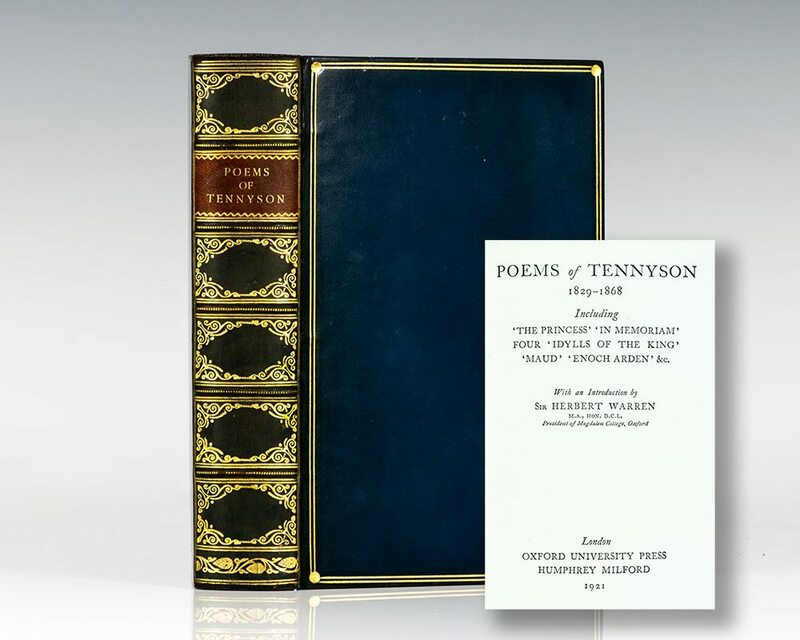 Poems of Tennyson, 1829-1868: Including The Princess, In Memoriam, Four, Idylls of the King, Maud, Enoch Arden, Etc. 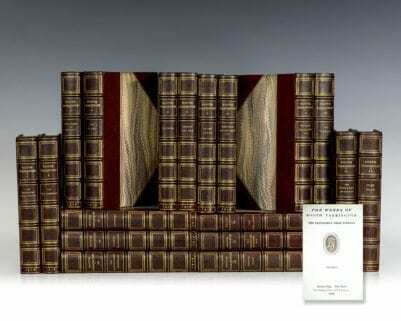 "Knowledge comes, but wisdom lingers": Finely bound by Riviere of Poems of Tennyson, 1829-1868. London: Oxford University Press, 1921. Octavo, finely bound in full leather by Riviere. Gilt titles and tooling to the spine, double gilt ruled to the front and rear panels, inner dentelles, marbled endpapers, all edges gilt, slipcase. Frontispiece of Tennyson. Introduction by Herbert Warren. In near fine condition. As source material for his poetry, Tennyson used a wide range of subject matter ranging from medieval legends to classical myths and from domestic situations to observations of nature. The influence of John Keats and other Romantic poets published before and during his childhood is evident from the richness of his imagery and descriptive writing. He also handled rhythm masterfully. The insistent beat of Break, Break, Break emphasizes the relentless sadness of the subject matter. 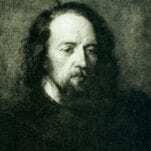 Tennyson's use of the musical qualities of words to emphasize his rhythms and meanings is sensitive. Tennyson was a craftsman who polished and revised his manuscripts extensively, to the point where his efforts at self-editing were described by his contemporary Robert Browning as "insane", symptomatic of "mental infirmity." Few poets have used such a variety of styles with such an exact understanding of metre; like many Victorian poets, he experimented in adapting the quantitative metres of Greek and Latin poetry to English. He reflects the Victorian period of his maturity in his feeling for order and his tendency towards moralizing. He also reflects a concern common among Victorian writers in being troubled by the conflict between religious faith and expanding scientific knowledge. 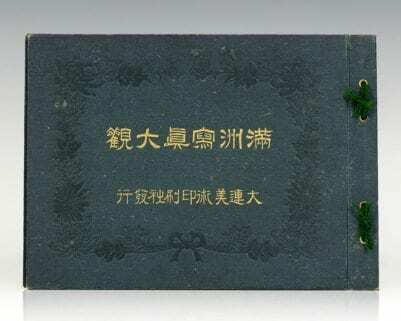 Like many writers who write a great deal over a long time, his poetry is occasionally uninspired, but his personality rings throughout all his works. Tennyson possessed a strong poetic power, which his early readers often attributed to his "Englishness" and his masculinity. Well known among his longer works are Maud and Idylls of the King, the latter arguably the most famous Victorian adaptation of the legend of King Arthur and the Knights of the Round Table. 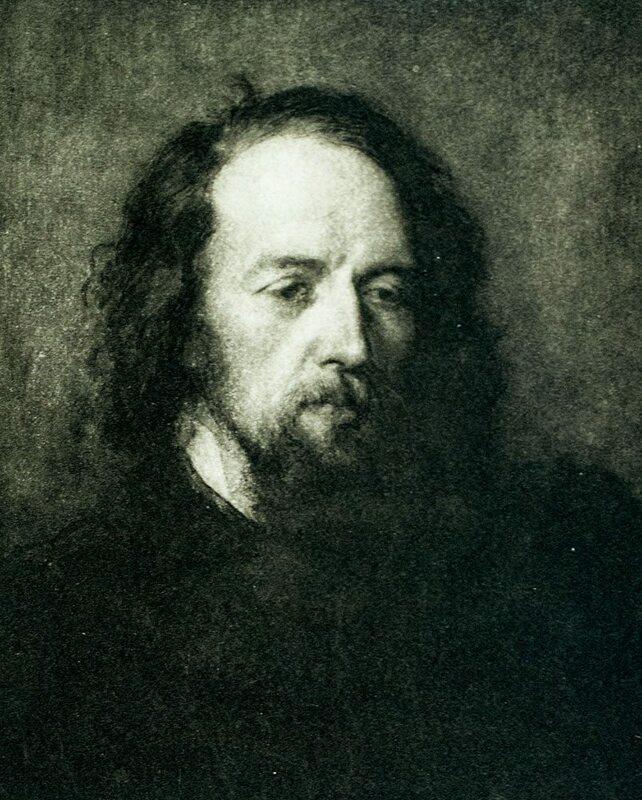 A common thread of grief, melancholy, and loss connects much of his poetry (including Mariana, The Lotos Eaters, Tears, Idle Tears, In Memoriam), possibly reflecting Tennyson's own lifelong struggle with debilitating depression. T. S. Eliot famously described Tennyson as "the saddest of all English poets", whose technical mastery of verse and language provided a "surface" to his poetry's "depths, to the abyss of sorrow". Other poets such as W. H. Auden maintained a more critical stance, stating that Tennyson was the "stupidest" of all the English poets, adding that: "There was little about melancholia he didn't know; there was little else that he did" (Norton Anthology of English Literature). London: Henry S. King and Co, 1875. 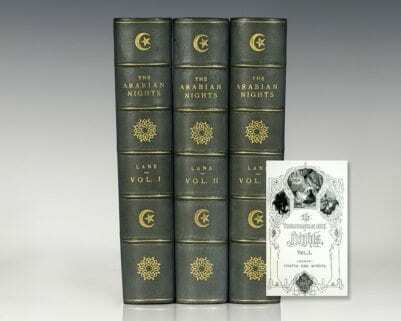 First edition, first issue of the first book in Tennyson’s historical trilogy with “behled” on page 126. Small octavo, bound in full red morocco, gilt titles to the spine, elaborate gilt tooling to the spine and panels, double gilt ruled, all edges gilt, marbled endpapers. Association copy, signed by Alfred Tennyson on the title page with Ellen Terry’s inscription below, “From her loving Ellen Terry” and below that “Her old friend, Henry Irving.” The recipient, Sir Henry Irving performed in and produced the the first production of Queen Mary at the Lyceum Theatre in April of 1876. The book was likely giving from Tennyson to Irving, and later from Irving and Terry to a female recipient. Henry Irving’s bookplate to the pastedown. In good condition. 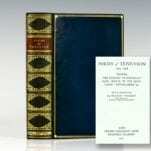 Rare and desirable signed by Tennyson.